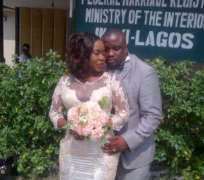 Everything seem to be coming 'double-double' for Nollywood actress, Lolade Abuta and her Heartthrob, Oluwagboyega Lopez. Few weeks ago, the two love birds welcomed their first baby together. Subsequently, they staged the child's christening at Lolade's Magodo Estate home on the morning of October 9th, 2014. The event was coordinated by her pastor who later named the bouncing baby boy Olamiposi Oluwafikayo. Subsequently, a big party was later held in the evening at 1, Oshikomoya Street, CMD Road, Magodo, Lagos, Nigeria. The big day was witnessed by friends and family members of the couple with few colleagues in attendance. To top to that, the couple have legally been joined together as husband and wife. They had their wedding at the registry on Friday, November 27, 2014 at the Ikoyi Lagos registry.